Video lessons, examples and solutions to help Grade 6 students learn how to recognize that a measure of center for a numerical data set summarizes all of its values with a single number, while a measure of variation describes how its values vary with a single number. 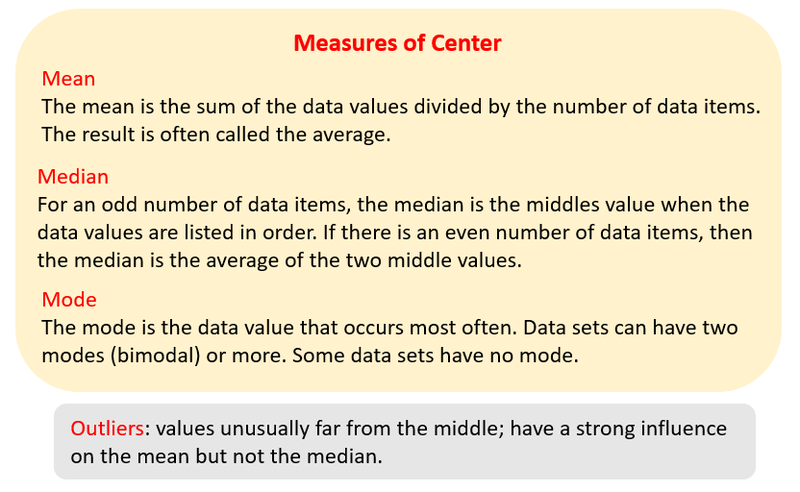 I can recognize there are measures of central tendency for a data set, e.g., mean, median, mode. I can recognize there are measures of variances for a data set , e.g., range, interquartile range, mean absolute deviation. I can recognize that measure of central tendency for a data set summarizes the data with a single number. I can recognize that measures of variation for a data set describe how its values vary with a single number. The following figures show the Measures of Central Tendency: Median, Mean, Mode. Scroll down the page for more examples and solutions. The following table summarizes when to use Median, Mean, or Mode. Scroll down the page for more examples and solutions. An outlier is a data value that is distinctly separate from the rest of the data. Find an outlier in the data and tell how it affects the mean. Which is the best measure of central tendency? Mode: When the data is not numerical. Median: When there may be outliers. Mean: When there are no outliers. Distance traveled in miles to visit relatives during winter break: 210,45,10,108,452,225,35,95,140,25,65,250. 1. Find the mean and median of the data set. 2. Identify if there are any outliers. 3. If there is am outlier, find the mean and median without the outlier. 4. If there is an outlier, how was the mean affected by removing the outlier? Quick review on mean, median, mode,range, outliers. This video takes a deeper look at whether the mean, median, or mode should be used to describe a set of data. Which one is better? 1. Find the mean of the data. 2. Find the distance of each data point from the mean. 3. Find the mean of the distances. Review how to find the MAD or mean absolute deviation of a given data set. 2. Find the distance that each element in your data set is away from the mean. 3. Calculate the mean of the distances.